Sunday Nov 5th is the return of the Retro Diva Hawaiian Brunch and Bazaar hosted by the historic Trader Vic's Emeryville. This marks our 1 yr anniversary and boy do we have a doozy in store for you. No Cover Charge and Kid Friendly! You do not need to have brunch to attend the event, but if you would like a table you should book now as it will fill up! Mahalo and see you there! The Bay Area has a hot new Tiki spot! 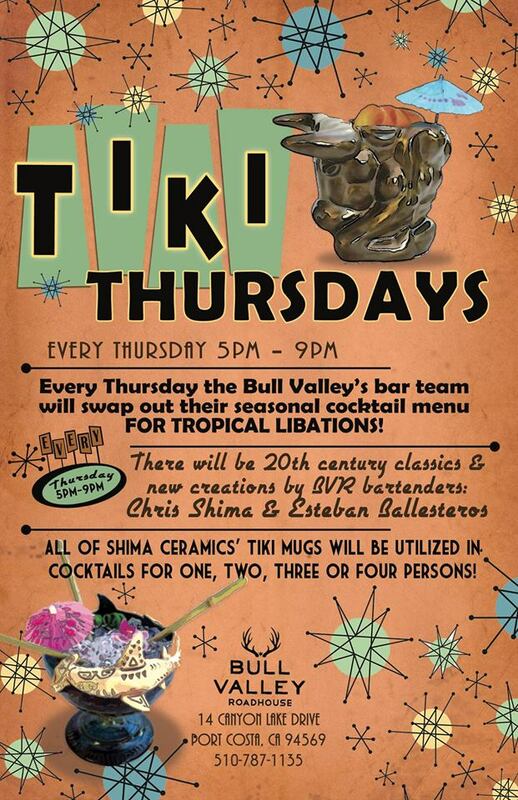 Every Thursday, the Bull Valley Roadhouse (voted SF Chronicle's Top 100 for 5 years in a row) serves Tiki drinks, made with the finest ingredients and with the same craft-cocktail precision as its other award winning cocktails. Select drinks are served in a handmade mugs from Shima Ceramics. If you'd like to meet me (Chris Shima), I will be behind the bar mixing the drinks. EVERY Thursday at the Bull Valley Roadhouse, in Port Costa, CA. Full dinner menu available at the bar. All ages welcome. Thursday hours 5pm - 9pm. Reservations encouraged.